Of all the fungus that passes through the lab Aspergillus species are among the most common, second only to Candida species. 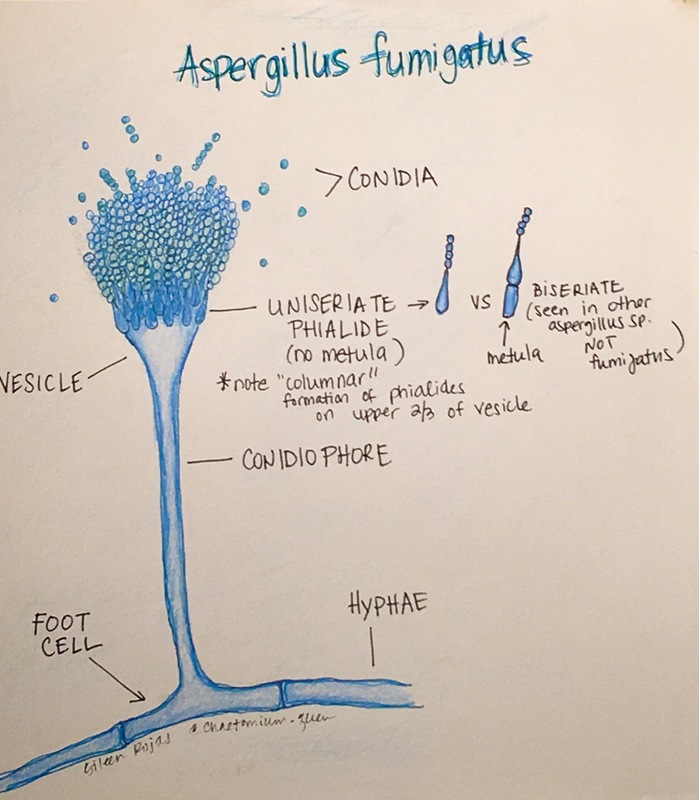 Of all the Aspergillus species isolated, Aspergillus fumigatus is the one that is most commonly isolated. This organism is described as being “ubiquitous in nature.” It is found pretty much everywhere, and as a result is a frequent contaminant in the laboratory. 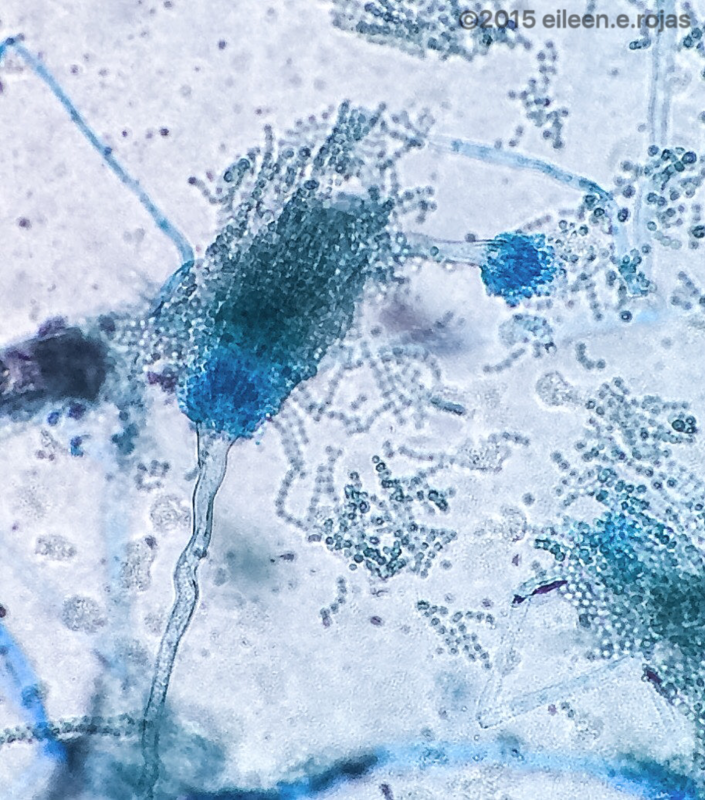 That being said, Aspergillus can cause a plethora of health problems. 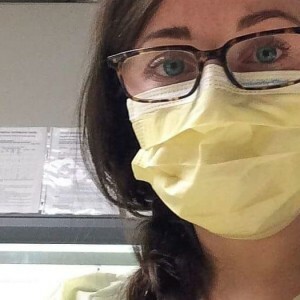 Neutropenia (abnormally low count of neutrophils), often seen in bone marrow transplant recipients or as a result of other cancer treatments (chemotherapy), is the biggest contributing factor in developing Aspergillosis. The infection can spready quickly and easily through the blood and can be found in multiple organ systems including: brain, liver, heart, and bone. 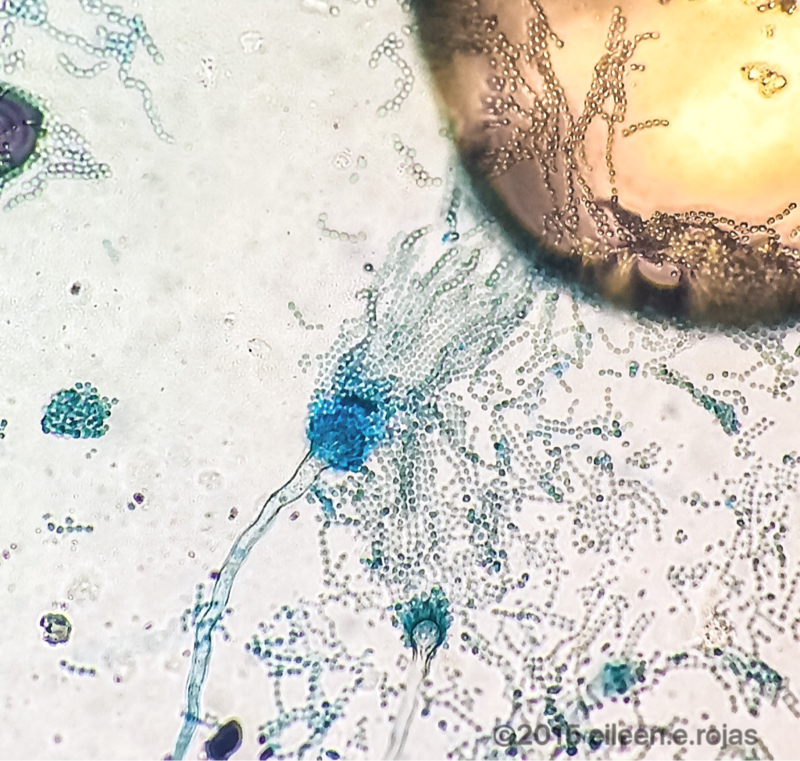 Aspergillus fumigatus is the most common cause of fungal sinusitis. For patients who are susceptible to mold allergies, Aspergillus can be a problem. This fungus is frequently found in buildings, air vents, compost heaps, and in the soil. Agriculture and construction workers who endure frequent exposure can develop “fungus balls” in the lungs. It’s basically what it sounds like; a ball of fungus fibers gets clumped up in the lungs and will trap things like blood cells which leads to a sort of clot. This is visible on x-ray, usually one of the first steps in diagnosis followed by collection of a specimen for culture. 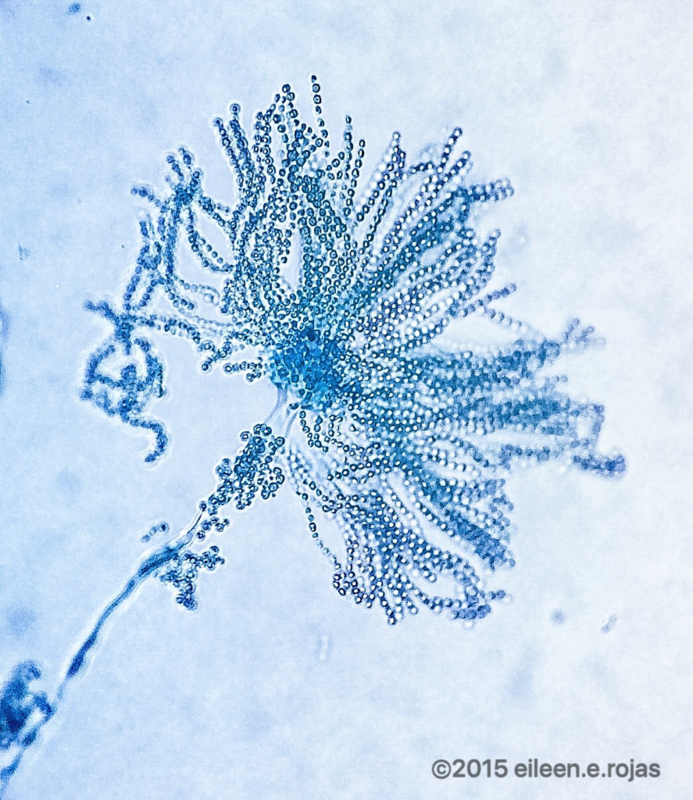 Most of the Aspergillus fumigatus I see is isolated from lower respiratory collections such as sputum or bronchial alveolar lavage, or deep sinus collections. Once the specimen is inoculated to the appropriate growth media, it grows rapidly. If the organism is particularly robust, it may even be possible to identify after just 2 days of incubation (typically 3). On agar, the colonies of Aspergillus fumigatus grow in various shades of green and typically have a white border (periphery). The reverse side of the agar can range in color from white to tan. 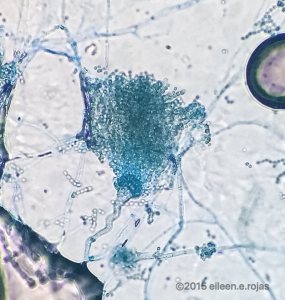 Microscopically, Aspergillus species have a large swollen vesicle at the end of the conidiophore which is supported by a foot cell. The vesicle of Aspergillus fumigatus bears uniseriate phialides, which in turn bear chains of round conidia. The phialides typically arrange themselves on the upper 2/3 of the vesicle in a “columnar” fashion, meaning they tend to grow straight up like the columns on a building.